No matter where we live, what we do, how fast we are, what our dreams are, what we are running from, or where our miles lead - we are a running family. We mark miles, we ache, we try, we fail, we triumph and we endure. Finally, after 4 months, and not nearly enough training, race day was here. I'd stayed up a bit too late the night before running around and getting everything ready. Gels? Check. Bib? Check. GPS watch, plugged in and charged? Check. Shoes? Check. Those of you who have raced know the drill. Then there's all the extra stuff, like the post-race clothes and footwear, maybe some recovery food too. I really should have done all this earlier on in the day, or even a few days ago, but it was an exceptionally busy Saturday in the Mora household. Lots of running around, errands, shopping, etc. On Saturday evening I travelled down town to the Old Spaghetti Factory to meet up with some folks I'd been following on Twitter and who's blogs I've been reading in the past few months. In this training cycle, my motivation for getting out and training has been non-existent. I started reading these blogs to glean some inspiration and even just good running vibes. The running community is unique in that everyone (at least everyone I've come in contact with) is super-nice and supportive of each other. It doesn't matter how slow or fast you run, or what you look like, or what your accomplishments are; they are all celebrated equally. They pick you up when you're down, and they cheer when you're up. One of these people, Krysten, who writes The Misadventures of a Darwinian Fail blog, organised a meet-up of people running races this past weekend. I thought it would be fun to meet some of these people in person. I even cajoled one of my runner friends Sharon to come along. The meet-up ended up being a great time. 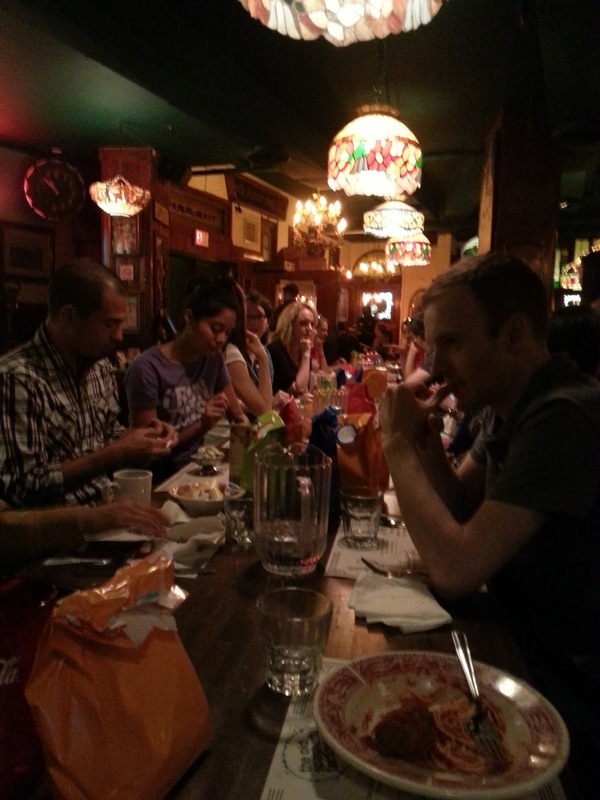 Everyone was pretty comfortable with each other; talking about races past and present, and even non-running stuff. It was a very relaxed and friendly environment, and I had a great time. Krysten even arranged for us to get "goody bags" with gels, gummies, and other stuff. Very cool! You can see a list of everyone who's there, their Twitter handles and links to their blogs at Krysten's web site above. I always sleep terribly the night before a race, and this one was no exception. I was actually up before the alarm went off, but kind of lay in bed drifting in and out of sleep. The race started at 7:30am, and I like to be at the starting area at least 1 hour before, to get the bag check, bathroom, and warm-up run rituals over with. Since the race is a point to point, you have the option of parking at the start, or close to the finish, and using the free shuttle bus service the marathon provides. In the past, I've parked at the start. This time, however, they recommended parking at a designated spot close to the finish, and taking a shuttle to the start. The last shuttle left at 6:30am, so I had to be there by AT LEAST 6:00am, which meant I had to leave at 5:15am. YUCK! Needless to say, I ended up sleeping in, wolfing my breakfast down and forgetting to eat some of it (which will affect me later on in the race), and running out the door. Fortunately traffic was very light, and I made it out to Mississauga by 6:20am. I need not have rushed; there were lots of people waiting around for shuttles, and they were running past 6:30am. Normally I do races with other people; at the very least, even if we don't run together, we end up car pooling, hanging out before and after, and maybe even going for lunch. Not this time. I was the only one doing Mississauga. I won't lie and tell you it wasn't a bit lonely. I chose this race because I really like it. The course is nice, the organization is fantastic, and I've had my best marathon times on this course. 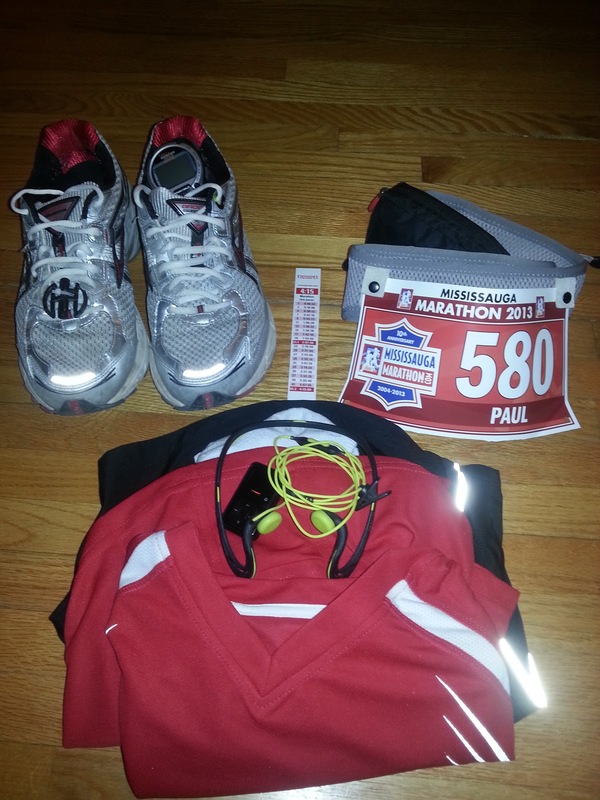 This will be my 4th time running it, and my 15th marathon overall. May as well do it on a course you like! The shuttle deposited me at the start line at around 6:50am. I wandered around a bit, watching all the runners getting themselves ready. The half and full marathoners were starting together. later on down the course, they would split off and do slightly different routes, but end up all at the same finish line. I love the pre-race atmosphere. Everyone milling around; some nervous, stretching, checking gear, eating that last minute morsel of food, trying to keep warm. This year it wasn't nearly as cold as previous years, but it was still a bit chilly standing there in shorts and a T-shirt. I decided to get rid of my bag at the bag check and start my warm-up. The bag check was the first place I saw the results of the Boston Marathon bombings which had happened less than a month before. There were police EVERYWHERE at the start. At the bag check, they were searching through all bags going on the truck. The added presence of the police was a reassuring one. Not that these things get very rowdy, but it's nice to know that they were there to keep us safe, and the extra checks really didn't slow things down a lot. After a 15 minute warm-up run around the parking lot (the marathon start line is next to a huge mall), I was ready to queue up. I made my way through the crowd to just in front of the 4:15 pace bunny. I wasn't going to follow the bunny, but wanted to be in the crowd at around the pace I was hoping to finish at. (yeah, hoping, more like DREAMING) The announcer was keeping the crowd focused as the time ticked down. He read off a list of runners that had run the marathon every year for the last 10 years (this year was the 10th anniversary). He lead us in a moment of silence for the victims of the Boston bombing. The Hazel McCallion, the Mayor of Mississauga, came on the microphone, and counted us down to the gun. With a blast of the horn, we were off and running. Over the course of the last 14 marathons, I've learned one important lesson; make sure you don't get sucked into the vortex of the faster runners as they blow by you. Stick to an easy pace, even slower than your normal one, for the first 2-3km so you can warm up and get into your groove. I've also found that in Mississauga, because all the half and full marathoners start together, it plays tricks with your head. You would see someone run by and weave in and out of people, and think, "Maybe I should pick it up, that guy is motoring by me!" not realizing that they are running the HALF, not the FULL. So as this was happening, I just kept to my regular pace, around 5:30min/km and let them surge ahead. As I've mentioned before, my training for this race has been sub-standard. I've missed many long runs, almost all the hill workouts, and even most of the tempos. I knew that I didn't have the base required to run this race properly. Since they put water stations every 2km on the route, I decided to walk through each of them, take some water and/or Gatorade, and make that my rest. In training, through the long runs I've done, I have followed the Running Room 10 & 1 regimen: 10 minutes running, 1 minute walking. At my pace it was basically 10 minutes of running between stations, so it worked out well. I also knew it was going to be a hot one today, and that in past long runs, my calves have cramped up, likely due to loss of salt due to sweat, so I felt it was smart to drink Gatorade to replenish that. I even brought some salt packages I stole from McDonalds in case I needed more. I also brought music with me to listen to, but didn't start with it on. I was saving it for when the run got real tough, and I needed something to keep my mind off it. But I'm not a big fan of training with it, unless I'm at a gym running on a treadmill. When I'm outside, I like to let my mind drift; take in the sights and sounds. Thanks to my 15 minute warm up I fell into my groove early in the race. The sun was shining, I was feeling pretty good, and cruising at my regular pace. I vowed I'd try and enjoy the race as much as I could, before it started to get ugly. Maybe, just maybe, I could sustain it far into the race, and say that it was a good experience. Maybe this all gave me a false sense of hope, that I might pull it off, even without the training. When I looked at my watch, and pace band, it turned out I was 10 minutes ahead of my scheduled time. Sweet! Maybe I can pull this off after all! Well, no. You can't fool the marathon. If you don't put in the miles, it will come back to get you. You may feel good now, but 42.2km is a LONG LONG time to be running. Reality set in right around the 26km mark. Looking back I shouldn't have been surprised, since I hadn't run anything longer than 23km in training. At this point in the race, I noticed that my right hamstring was becoming numb, like it was asleep. It was a weird feeling, and becoming weirder and number the further I ran. At the next water station I attempted to massage it a bit with my fist, trying to get some more feeling into it. It worked, but as soon as I started up, it became numb again. I also started, at this point, to feel very tired. My posture started to droop; I began to hunch over and get tight across the shoulders and back. I always "turtle" when the run gets tough. Pretty soon after that, at around 30km, I had to walk mid-way between water stations. "This is the start of the end" I thought to myself, and I still had 12km to go. From the 30km mark right up to 41km was a symphony of suffering. Numb leg now very uncomfortable. Legs tired, have no energy. Heart rate climbing. Day getting hotter. Blister developing on left 2nd toe. Gels not working to keep me energized. The Gatorade didn't entirely stop my calves from cramping up. The music wasn't driving me forward like I thought. I was barely able to run 1km without a walk break. The time on my watch was now telling me I was 10 minutes past my goal time of 4:15. Lovely. I told myself that I just need to finish, and that if I really REALLY tried, I could beat 4:30. So for the last km, despite all the pain, I dug in, and ran it through to the end, finishing in 4:29:52 (chip time). The finish line at Mississauga is both good and bad. It's good in the sense that it's almost always lined with tons of people cheering you on. It is a foot-path until it opens up into the parking lot, so people are really close in, yelling in your face to KEEP RUNNING! FINISH STRONG! all that stuff. When it opens up, there are TONS of people screaming at you, including the announcer who says your name real loud for everyone to hear. The bad part is that you can see and hear the finish line when you're still 1km away. For me, that was 6 minutes of listening to the announcer, knowing that the finish is still so far away. As I came into the last 300 metres or so, I saw my friend Phaedra (writer of the Blisters and Black Toenails blog) cheering. Finally someone I know! I waved, and dug deep, and motored (probably more like lurched) my way through to the finish. I was fortunate to be the only one at that moment running through the finishing chute, so I raised my arms and the crowd rewarded me with some good cheering. I crossed the line, and I was done. I put my face in my hands, and wept. The effort for me to get across that line was more than I'd put forth in any race. I was totally spent; I had nothing left. But, as a wonderful volunteer put the medal around my neck, I was happy. I have finished my 15th marathon. I didn't give up. I didn't drop down to the half. I am stubborn, and I wanted to finish this race, and I did. After the race was over, I hobbled over, got some food, and lay on the grass relaxing in the shade of a tree. Eventually I changed my shirt and shoes for my comfy Crocs and race shirt, and limped my way over to the shuttles. Post-race meal was a greasy bacon cheeseburger at 5 Guys Burgers with my friend Craig. That, and a grande Starbucks, and I was back in the car, heading home, where a hot shower and (hopefully) a nap awaited me. The statistics of my race are here: http://tpks.ws/DWu4. You can see exactly where the wheels fell off. My heart rate is the most telling one. It went from a relatively flat and steady line (with dips where I took my walk breaks) to a crazy jagged line. Did my heart rate actually get to 239bpm? Is there a lesson here? Yes. I need to stop doing these half-assed races. If I commit to a race, I need to commit to the training. No excuses. Sure, life gets in the way sometimes. But I am determined not to let this happen again. No more half-assed marathons. 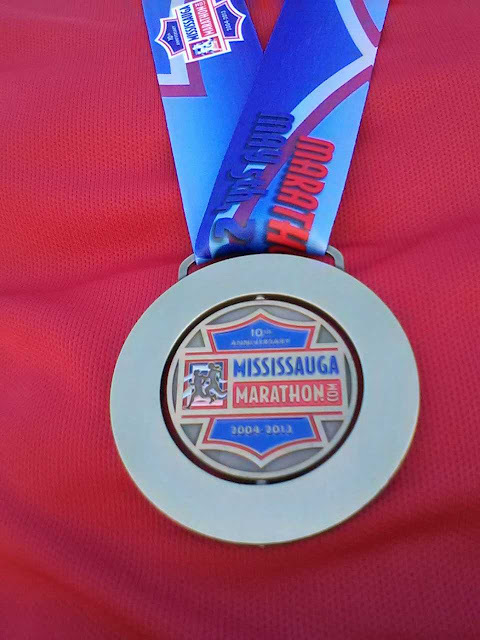 The next one is in August, as part of the ENDURrun Sport series of races. It's going to be super-tough. But dammit, I'm going to TRAIN like a BOSS for it! Some thanks on the way out. Thank you to my wife, who kicks me out the door for a run way more than she should. Thanks to the Flying Fartleks, my running crew without whom I'd be on the couch or sleeping in bed instead of running. Thanks to RUSH for powering me through that last kilometre with "Marathon" (I couldn't have timed that any better!). And thanks to any of you readers who have ever tweeted or commented or liked any of my Facebook, Twitter, or blog posts about my training. Your support is very much appreciated, and I hope I can return the favour.